To combat poverty in the district of Moatize, the program of integrated rural development invests in the marketing of the products of horticulture. The program is implemented in eight communities, where young underprivileged farmers are its target group. 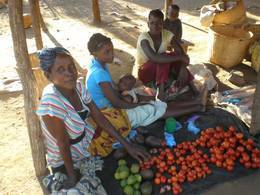 To commercialise the heightened output of crops is confronted with great difficulties. These consist in the lack of markets on which to sell the products, missing transport and the resulting inaccessibility of some markets. In face of this situation the program's team tries to show up solutions. They hold workshops and analyse the markets and seasonal production circles. A collective transport-system of the products to the principal markets of Moatize, Matundo, and the city of Tete is set up. Regular trade fairs and markets are organized to get the communities into contact with street vendors. Through these actions some producers have gained in commercialisation of their products and thus have been able to enhance their living conditions. Some have even acquired bicycles, hay trailers or motorbikes.